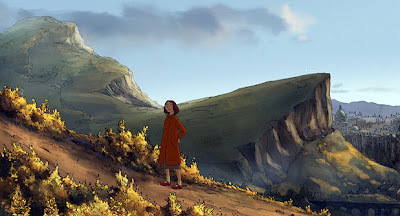 L’illusionniste [The Illusionist] is a delightful little gem of an animated film. Receiving a deserved nomination for Best Animated Feature at the 2010 Academy Awards, French director Sylvain Chomet (The Triplets of Belleville), has beautifully brought a 1956 original screenplay from legendary mime, director and actor, the late Jacques Tati, to life. This magical story is centered on a struggling illusionist (resembling Tati’s famous character M. Hulot) who meets a curious young girl while performing at an isolated Scottish community, who later joins him in his travels, looks up to him as the father-figure she has never known and believes his magical powers to be real. Not only is it endowed with impeccable animation and charming, pleasant sensibilities, but also addresses themes of modernity in the late 1950’s, the rise of consumerism and the unfortunate death of classically skilled artisans like the protagonist. These are themes that were also present in some of Tati’s most acclaimed works, notably the fantastic Mon Oncle and the only film of his I am yet to see, his final work, Playtime. The film’s laborious pace will cause young ones to fidget, while the tributary appreciation for Tati’s work that shines through in every sequence will also be lost. Essentially, this is an animation for adults, and a pretty good one I think. A skilled, well-meaning illusionist (known by his stage name “Tatischeff”) has realized that his popularity and employment opportunities in Paris are in decline. 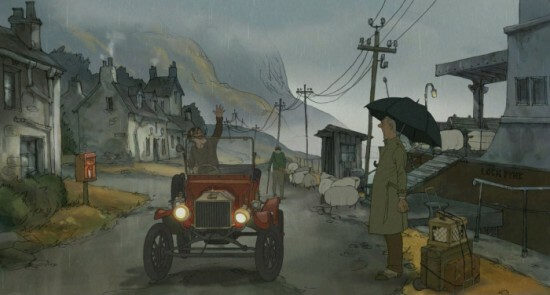 He packs his meager belongings, including his ill-tempered rabbit (a highlight throughout the film), and moves to London. Here he finds himself passing newly established television stores in the streets and following up popular rock bands. His skills are no longer desired or required to keep people entertained, with more glamorous competition emerging each day. Not content to just give up, he continues trying his hand at smaller gatherings in bars and cafes, but is met with similar disinterest and resentment. Finally, he accepts an invitation from a drunken patron at a private party, taking a lengthy journey by train and boat to a remote Scottish Island. He performs in a small village pub and is met with rousing applause. He lives in a small room above the pub, where he encounters a girl named Alice, who works there as a housekeeper. Alice is captivated by Tatischeff’s skills, believing his magic to be the real deal, and is humbled by his kind acts of generosity. When he realizes that he can no longer support himself in the village, he decides to try his luck in Edinburgh, with a curious Alice in tow. He books performances in a local theatre and the pair live together in a rundown hotel, sharing the building with other fading performers (a trio of acrobats, a clown and a ventriloquist) who, despite the kindness of Alice in sharing meals with them from time to time, become increasingly destitute and depressed about their fading trades. L’illusionniste functions almost as a silent film, utilising very little audible dialogue. Often it is restricted to indecipherable gibberish, but there are the occasional flashes of French or English. This absence is not as big a turn-off as you would expect. In most cases, what is being said has no consequence, because all that we need to know is revealed through the animated graphics, which are quite wonderful. The quality of the score (also by Sylvain Chomet) and the sound effects more than effectively make up for this absence also. It is extraordinary how skilled the animation is and how much intricate detail is present in every frame. A large proportion of the scenes exist as brief vignettes, lasting as little as only a couple of seconds on occasions. But it is clearly evident how much work has gone into making every scene perfect. There are always a number of different things happening in every scene, with a quick glance around the frame sure to reveal fleeting amusements. The beautifully realized streets of Paris, London and Edinburgh, and the small-town atmosphere of the Scottish Island are a delight. It is always so refreshing to see filmmakers stick with this mode of animation, when we are consistently bombarded with big-budget studio productions with computer-generated animated visuals. It never divulges in unnecessary exposition, but simply just tracks the journey of the illusionist as he struggles to make a living in a world where society’s desire for entertainment is rapidly changing. Here, accompanied by a young girl intrigued by his skills, his formerly modest and minimalist lifestyle is given an awakening by Alice's material curiosity. Wishing to keep her happy and maintain his generosity, he rewards her housework and cooking with lavish gifts, including a coat and a pair of shoes, but as a result struggles to make ends meet. I found the film to lag a little in the middle third, and where the film ultimately succeeds or fails for viewers, is the nostalgic appreciation for Tati's work. Viewers with no knowledge of Tati will no doubt find this film somewhat dull (despite it's beauty) because there isn't a lot that happens. I too thought it got a little bogged down, a little repetitious, and I lost interest briefly when he was trying unsuccessfully to earn some money through an alternate means. This is a film that, above all, makes you feel good about the life you lead and as a result I was greatly moved by the conclusion. While I'llusionniste will no doubt have a short run in Sydney cinemas, it is well worth a look. Few animated features possess such magic. Another supposed "great" picture from last year - ex: "Another Year" and "Rabbit Hole" - that I'm having trouble sitting down and watching. This was my favorite film from last year so I'm glad you checked it out. I love how much nuance and depth is in a film that has so little dialogue. I think it demonstrates the pure power of the images. Tati is one of my all time favorite directors so I knew going into this that I would love it. You've got to check out Play Time. It's considered by many as his best. He actually made one film after Play Time called Trafic. It's a decent little film, but not nearly as good or noteworthy as his previous features. I'm eager to see this but the only reason I'm reluctant is because the only other film by Chomet I saw was his short on Paris Je T'aime which I loved. I want to see more of his work. As far as Tati, I just saw Mr. Hulot's Holiday on Sunday which I thought was pretty good. I'll try and check this film out soon. I really want to see this feeling it looks beautiful and the story is really intriguing. I'm going to have to disagree on your last paragraph, Andy: "Viewers with no knowledge of Tati will no doubt find this film somewhat dull (despite it's beauty) because there isn't a lot that happens. I too thought it got a little bogged down, a little repetitious, and I lost interest briefly when he was trying unsuccessfully to earn some money through an alternate means." I have no knowledge of Tati's work, only that I know he is supposed to be one of the greats. However, The Illusionist was, for me, by far the best film of last year - no contest - and sits firmly on my favourite films of all time list. Nicely written, though, as always! @ Sam - It's certainly worth the time. @ James - I saw it topped your 2010 list, which is very interesting. I thought the depth and detail to the images was really astounding. For some reason I thought Playtime was his last, but thanks for letting me know. My mum owns it. Next time I visit my parents' place I'll give it a watch. @ Steven - Mon Oncle is my fav. Tati but I think you will really enjoy this one. It has a sense of nostalgia, and while I can't say Tati is a huge part of my film passion, I did enjoy the appreciation for the man that emerges through the awkward physicality of the illusionist, and the charming sensibilities in regards to the beauty of the world and the clash of artisans with inevitable modernity. @ Custard - Thanks for reading Custard. It is a very beautiful story. @ Cherokee - We must have posted at the same time. I felt, as I was watching it, that this would please more of a niche audience than most animated films. The lack of dialogue, and the slow pacing, does make it a somewhat odd film. I can see why someone would be a little turned off by this. There were a few moments where I lost a little bit of interest, I am sorry to say, but for 95% of this film, I was entranced. But I appreciate your passion for this film. You and James both have it atop your 2010 list. I too, really enjoyed it, and it's a film I hope to enjoy again and again. Thanks for reading Cherokee. Appreciate the feedback. I saw The Illusionist when I was far too sleepy to keep up with the story progression (I'm planning to rewatch SOON now that it's on DVD here to rectify that lapse), but even so, the visuals I did see and the music were captivating. On Tati, you've got to check out Playtime as soon as you can. It's easily my favorite Tati, and hits wonderfully on some of the same themes of modernism and consumerism. I also like Trafic a lot, but not everyone does. 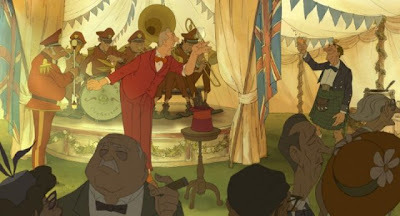 He also did an even later piece called Parade, which I think was made for TV, and is almost a circus variety show with himself as ringmaster, but it has some interesting twists on the conceit at the end. @ Jandy - Yeah, there is plenty to marvel at in the visuals, but it's a film that requires some attention. I'm sure you will love it. It seems I have some Tati to work through. It's never ending haha. For me was easily one of the most visually beatiful films of 2010. I liked how you didn't have to understand French, and yet could still understand more or less what was going on, though I could have done with a bit more story for it to hold my attention all the way through. The message of how someone can believe in you, more than you believe in yourself, was heart-warming I think.